The three basic ingredients of a Caprese salad are basil, mozarrela and tomatoes, but they aren’t the be-all and end-all of the dish. Eating a ripe, juicy tomato in summer is a delight. Sometimes that’s all you need to appreciate one of the best foods of the season. A Caprese salad, however, is another way to highlight great tomatoes – one that can also appeal to purists. Echoing the colors of the Italian flag, it’s often presented as an alternating sequence of basil, mozzarella and tomato. Simple enough, right? Use the best tomatoes. “I love it so much at this time of year when we have really good tomatoes,” says cookbook author and Italian food expert Domenica Marchetti. They should be ripe, fragrant and juicy. Marchetti especially likes heirloom tomatoes, which are often bursting with flavor. With their vibrant colors and interesting, bumpy shape, they look especially cool when sliced and layered Caprese-style.Grape or cherry tomatoes (a mix of whole and cut, combined with small balls of mozzarella) are excellent in summer, too. I find they’re the safest bet when you’re trying to put something together outside of peak season. Even the best tomatoes can benefit from salting, though. Sprinkle cut or chopped tomatoes with salt and let them sit for about 10 minutes before proceeding with your salad. This flavors the tomatoes and draws out some of their moisture, which you can discard for the sliced salad arrangement or use to your advantage when you’re going the chopped-in-a-bowl route (more on that below). Look for a moist mozzarella. The dry, shrink-wrapped mozz on the supermarket’s dairy aisle certainly has its place. I often prefer it for pizza-making because it doesn’t release as much liquid all over the pie. In Caprese, though, you want the cheese to be soft – often labeled as fresh mozzarella and packed in liquid. (You could even let slices of fresh mozzarella drain for a few minutes on a clean dish towel or layer of paper towels if you don’t want all the liquid pooling. )Famed Italian cookbook author Marcella Hazan appreciated the benefits of fresh mozzarella and how its milky whey would mix with the tomato juice and vinegar to form a sort of dressing perfect for dipping bread. 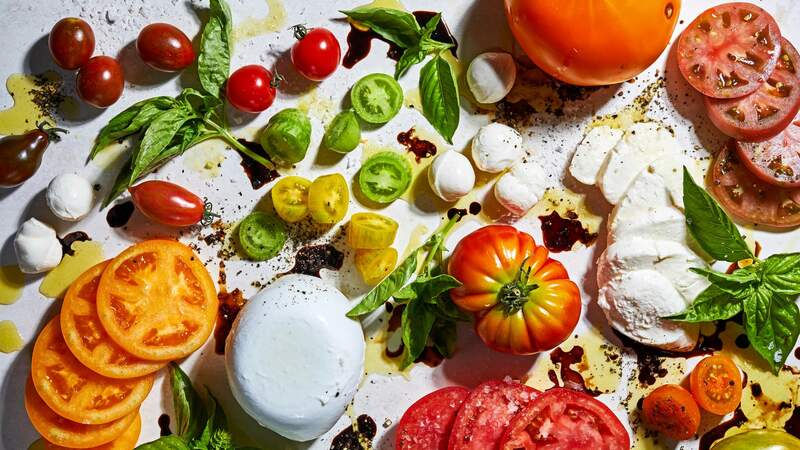 She favored buffalo mozzarella, although as Arthur Schwartz points out in Naples at Table: Cooking in Campania, in Capri – the Italian island after which the salad is named – the favored cheese is cow’s-milk mozzarella, or fior di latte. Either one works great, so use whichever you like (or both). Grab a good extra-virgin olive oil. With so few raw ingredients in play, oil that is old or bitter will be noticeable. Be sure to use an oil that tastes good to you. Marchetti prefers using a variety with a grassy undertone because of the way it complements the flavors in the salad.Add other seasonings to your taste. A traditional take would be seasoned with nothing more than salt and pepper. “Even adding vinegar is already corrupting it,” says Marchetti, who at the same time admits to sometimes drizzling her Caprese with balsamic. You would probably not find it done in Capri or Naples, however, Schwartz writes.But, hey, it’s your salad. There are no Caprese Food Police. Even Hazan suggests red wine vinegar in the “Capri-Style” salad she shared from her husband, Victor, in her book Marcella Cucina. You could also experiment with a flavored olive oil. A bit of smoked olive oil mixed with regular extra-virgin olive oil really made one of our variations sing. A colorful and flavorful basil oil, in addition to or instead of the fresh herb, is a nice touch. Mix in different seasonal produce. Again, this is definitely a departure from the Italian standard, but Marchetti is a fan of ripe peaches or nectarines in a Caprese salad. Chunks of watermelon would also be right at home in a version with chopped tomatoes and hand-torn mozzarella.Don’t make it too far in advance. Caprese is at its best soon after it’s prepared. You don’t want the ingredients to bleed too much into each other, Marchetti says. You do, however, want your mozzarella to be at room temperature, so give it a little time on the counter while you prep the other ingredients.